Saturday night and the lovely folks of Loveland Colorado are singing their hearts out to a Marvin Gaye cover by Soul School at the annual Cherry Pie Festival. 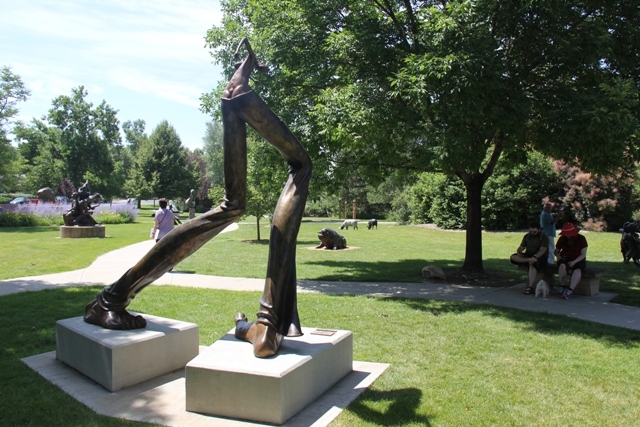 Just an hour north of Denver, in the foothills of the Rocky Mountains, this normally tranquil town with its beautiful lake and quite astounding sculpture garden is letting its collective hair down big time. And why not, after all cherries are in my opinion a very underrated fruit. This was a town, which at one time farmed over $1 million dollars of cherries a year, and to see it letting loose for a few hours all in the name of the humble cherry is almost like an expressionist art form. Not really surprising, as Loveland has been attracting artists for decades. It’s become such a creative draw, it has no less than three foundries to help create its magnificent sculptures.. 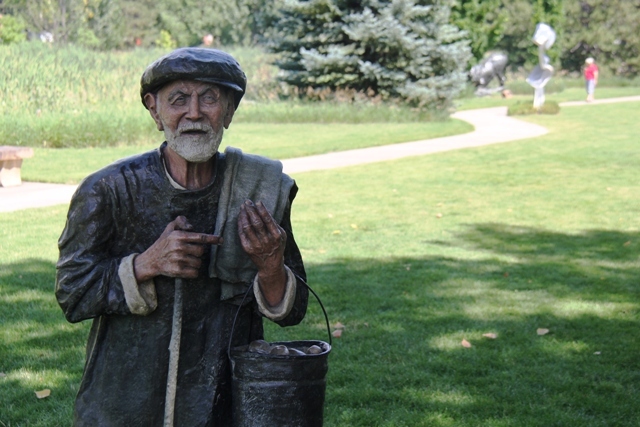 Many of these extraordinary works of art can be found standing in the Benson Sculpture Garden, a beautiful public space donated to the city by the Benson family. It is a very special place, with some quite magnificent sculptures. I fall in love with a huge black dog, a boy with giant legs and an incredible life like statue of a prospector. 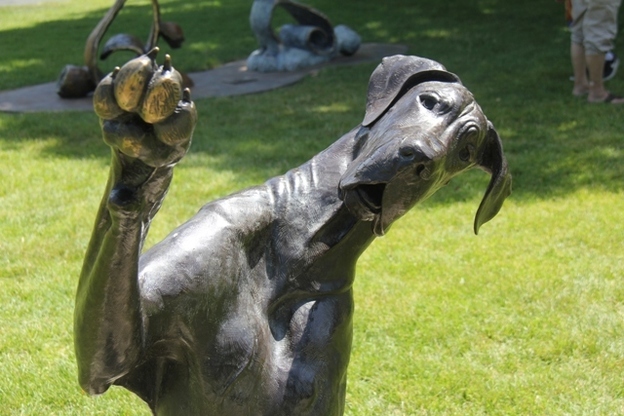 It’s the home of the annual Sculpture in the Park show which takes place each August and features not only local artists but creativity from all over the USA and the rest of the world. The aforementioned Mr. Loveland may well have been a big cheese back in 1866 but it doesn’t deter the city from exploiting his good name in the most obvious way possible. Loveland Colorado is the home of the official Valentine Re-Mailing Program, which began in 1947 and re-mails nearly 200,000 valentine cards each year all over the world with a hand stamped “From Loveland” post mark and special Valentine verse which changes each year. Of course, getting married here is another obvious one, and there are over 24 churches in town to help that happen. I try to spot some Elvis types walking around town, but realise this is not Vegas. Perish the thought. No, this is much more up market, and the whole marriage thing is a lot more discreet. Loveland is like that. It has this small town feel but it’s very classy when you look closer. Away from the festival site, Loveland’s lively downtown restaurants and bars are all doing business. It may not have the craft beer craze of Denver but there are plenty of choices from fine dining and farm to fork to family friendly eateries and more than a few trendy craft bars. Feeling peckish I drop in for a bite at Door 222, a new tapas inspired restaurant on east 4th street. Number 222 funnily enough. The fare from San Franciscan chef Matt Smith is fine and tasty, but don’t expect authentic tiny tapas portions. This is tapas USA style. Just a few minutes away from downtown you can shop till you drop at the Outlets at Loveland up to 70% discount at over 40 branded stores. 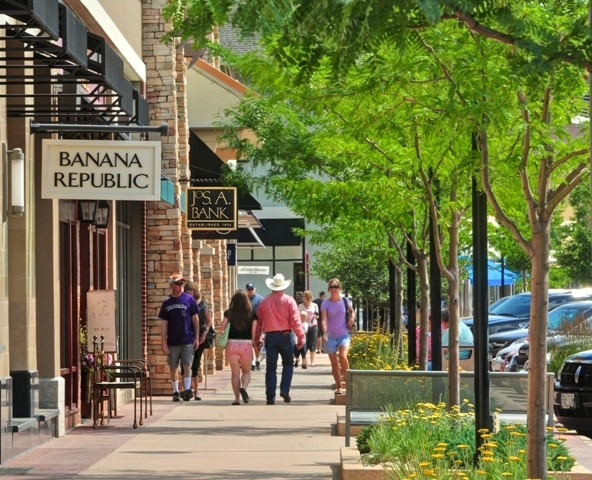 Or alternatively The Promenade Shops at Centerra has over 70 shops and restaurants. 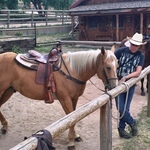 If you want an authentic cowboy experience then the Sylvan Dale Dude Ranch is just a few minutes drive outside town. A rustic ranch on the banks of the Big Thompson River owned and run by the Jessup family for generations. 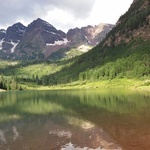 Don’t miss the Rocky Mountain National Park, no more than a 40 minute drive away. 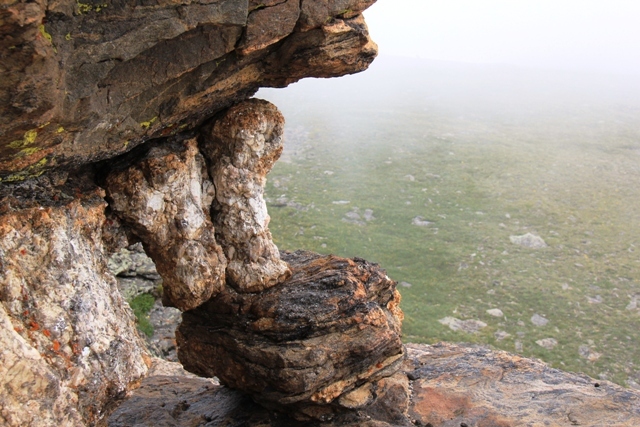 The scenic drive 12,000 feet up Trail Ridge Road is a spectacle that will live long in the memory. 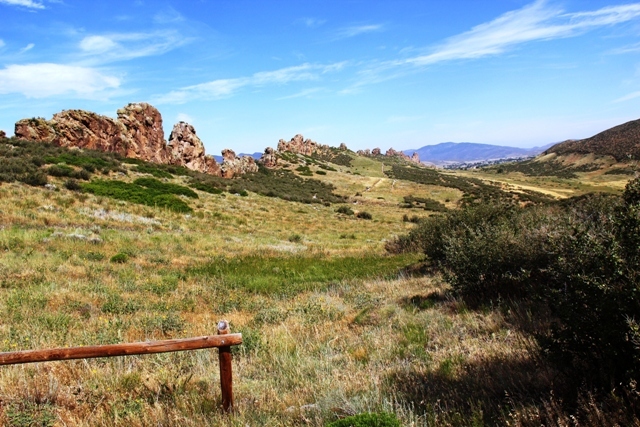 Perhaps you like hiking, then the Devil’s Backbone is an excellent trail. 15 miles of open Colorado prairie, with some memorable geology some millions of years in the making. Just watch out for those rattlers! Tell me more about Loveland Colorado, America’s sweetheart city. 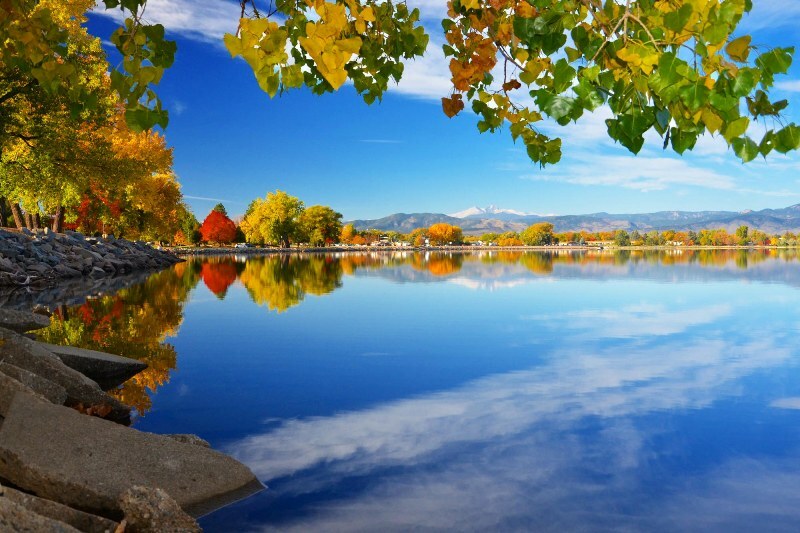 Loveland is a city just 40 miles north of Denver and is the gateway to The Rocky Mountain National Park. 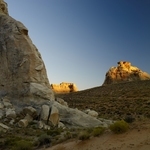 Click here for more information on visiting Loveland and Colorado.